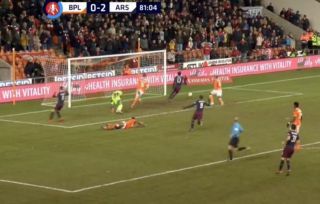 Alex Iwobi effectively put Arsenal into the 4th round of the FA Cup with his goal this evening, as the Nigerian’s strike handed the Gunners a 3-0 lead vs Blackpool at Bloomfield Road. The north London side were already two goals up thanks to a brace from Joe Willock, with Iwobi’s strike less than 10 minutes from time wrapping up a comfortable win for Unai Emery’s men. The goal came after a ball from Alexandre Lacazette to Aaron Ramsey put the Welshman through on goal, however his effort was saved, with Iwobi being on hand to tap the ball home. You can check out the goal below. Easy as you like from Iwobi!